If anything goes wrong, don't worry. We provide a 1-year limited warranty on all our products, you are also covered by your rights under the Consumer Guarantees Act 1993 (CGA). 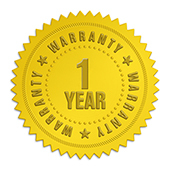 Warranty covers any manufacturing defect and early component failure through normal use. It doesn't cover accidental damage, wear and tear or failure through misuse. Warranty is Return to Base (RTB), we have our skilled agents assess the damage and we can either to repair the item, replace the item or refund you. We would request that you contact us in the first instance so that we can liaise with our technicians to resolve any problems without having to send the item(s) to us. Failing that, you may send us the item(s) and ensure they are carefully packaged to our base in Auckland, we reimburse any costs to you. We assess the item and advise you of the turnaround and resolution, if no issues are found we may charge a fee between for assessment by our agents/manufacturer for their time and cost. The repair time will vary depending on the issue and availability of parts. Please contact us via email: info@supero.co.nz if you require further information or to initiate a warranty claim, please ensure you include your order number and a detailed description of the issue.